WHEN he was little more than knee-high to a grasshopper, and not even at school, Larry Rivera would watch and listen in awe to his mother pickin' the ukulele at their home on Hawaii's paradise island of Kauai. And when other family or friends dropped around with their own instruments to play and sing island songs, the young Larry would get hold of one of the many spare ukuleles that lay around the place and copy-cat their every movement. Still not old enough to go to school he was soon playing simple tunes on his own, and already sensing that music would be a part of his life, took ukulele lessons as soon as he did start school... and by 16 had written his first song. All that was before Japan invaded Pearl Harbour and America became involved in the Second War, and today the near-octogenarian – he's 79 this year – entertains holidaymakers when they arrive at Kauai's Lihue Airport every Tuesday to join a cruise from there, has a spot on a local TV station, and puts on a weekly lunch show at a popular local restaurant entertaining a delighted 400 guests at a time. Somehow between all this he finds time to compose his own words and music – he's recorded sixty of his compositions on seven CDs and another is about to be released – and joins-in promotions of his island at shopping centres, trade shows, on radio and TV on the American mainland, Canada and Japan. And as something of a grand finale, he also organises weddings and renewals of vows, and sings, picks his ukulele and plays a guitar at these. And they're anything but your ordinary wedding or vow renewal: his are conducted on a replica of the barge and on the same lagoon at Kauai's Coco Palms Resort on which Elvis Presley married his sweetheart, Maile (Joan Blackman) in Blue Hawaii. Larry and the Coco Palms, one soon learns, are virtually as one: his got his first job there in 1951, and apart from a stint with the Army during the Korean War, has been associated with the place ever since... a whopping 58 years. When he first started in 1951 his mum would drive him to work at 4pm, he'd serve cocktails 'til dinner, wait on tables through dinner, collect diner's payments as they left, put on a little show for those who stayed on, sleep in the office after that (if anyone turned up late and wanted their key they'd wake him and he'd walk them with a torch through the palms to their bungalow)… and then he'd serve breakfast in the dining room for early departers before his mum would pick him up and take him home at 9am. Phew! Just listening to all this has you wanting to sit and take a deep breath. 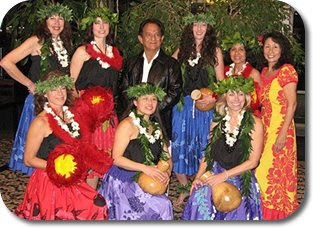 And understand why the Governor of Hawaii and Mayor of Kauai got together and declared this extraordinary one-man-show, Kauai's Living Treasure of Music. After his Army stint Larry was returning to Kauai in 1954 and on the plane sat next to Lyle Guslander, who mentioned he was the new owner of Coco Palms. Larry told him he'd like to get his job back there and Mr Guslander said "Tell the manager I sent you." Larry did, starting all over again tending the bar, waiting at table, serving breakfast – and singing to guests, including two who asked one night if they could join him on stage: their names were Elvis Presley and Patti Page. 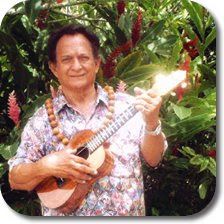 LARRY Rivera during one of his many stage shows on Kauai. 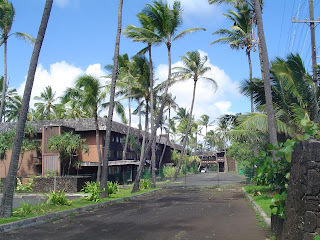 DESPITE many plans to restore it, the historic Coco Palms Resort is still derelict and boarded up from Hurricane Iniki in 1992. LARRY sings, strums the guitar and picks his ukulele on historic tours of the old Coco Palms; he does tours six times a week.